To all cute bento fans, Maki and I, along with Quirk Books, are holding a bento giveaway over at the Yum-Yum Bento website. Head on over to enter to win one of three bento lucky bags and an autographed copy of the book, signed by both authors! Yesterday we finally got around to going to a bike shop to buy me a bicycle to ride to work. While I currently walk to work, a bike would save me time while still giving me my daily exercise (and the same amount of extra points). We ended up spending quite a bit after accessories and safety stuff, so anyone who steals my bike will find themselves stabbed with chopsticks. After I’ve eaten my bento with them! This to me is essentially what I’m loving about WW. I haven’t really changed at all what my family eats. I simply eat smaller portions of what they have supplemented with 0 point foods. Which is why I was rather amused at the Costco ad, which is offering a deal in buying a whole crapton of NutriSystem foods. At first I thought this was a great thing, because you didn’t have to worry about cooking. But then I realized, having to cook food for other people to eat and then make yourself eat something else just seems like such an isolated approach. At least this way, I feel like I’m still part of the family in a nutritional way. 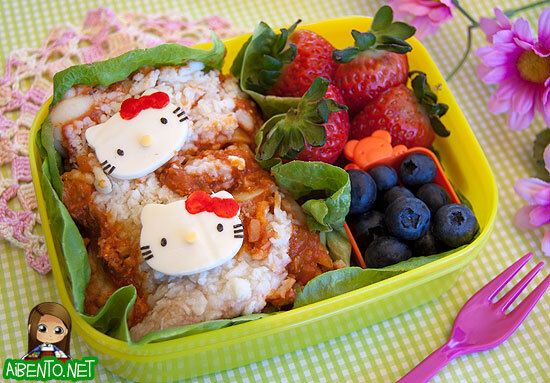 This bento contains about 1 1/2 servings of lasagna. I included on the side a fruit dessert of strawberries and blueberries. 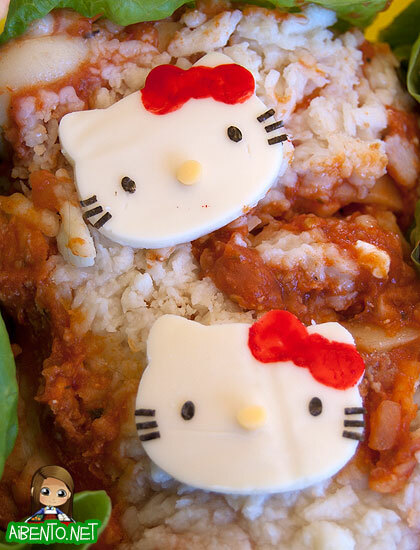 I topped the lasagna with Hello Kitty cheeses. I cut the heads out by using my Hello Kitty Veggie Cutters from J-List. The punch I used for the eyes was from this onigiri maker set. The punch is made out of plastic though, so it’s very hard to use. I used one of my little Carla craft punches for the whiskers and cut her nose out with a pinched coffee straw. The bows I painted on with food coloring using a toothpick. The Weight Watchers weight tracker still has my weight loss from 3 years ago in it, so the damn thing keeps showing me as having gained 16 pounds. Way to dig it in! Anyway, I lost 3.6 lb this week and since there’s no way to tell the tracker that I was simply having womanly bloating issues last week, it scolded me for losing too much weight too fast. Comparison from this week to next week should show my most “accurate” weekly loss.